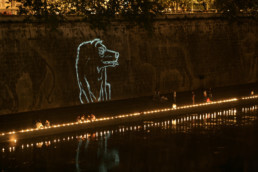 Ombre dal Lupercale (Shadows from the Realm of Wolves) was a nightlong series of site-specific works lasting from dusk until dawn. 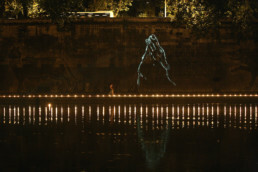 On June 21, 2006, Midsummer’s Eve, a fusion of river, sound, and light drew the public to the Tiber River. 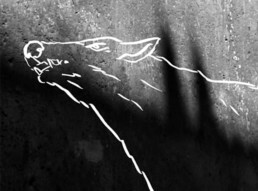 A frieze of 12 majestic She-Wolves etched from the patina of time stood guard on the high embankment walls, marking the site. 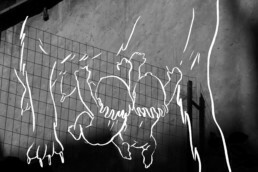 Seven artist-composer collaborations transformed the space with ambient sound-image installations. 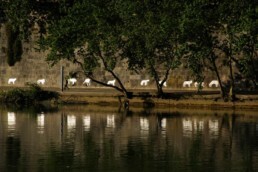 The summer solstice of 2006 was celebrated by a number of artists and composers for this site specific installation that ran from dusk til dawn between the Ponte and Ponte Mazzini. Each artist took turns at interpreting the myth of Romulous and Remus.